I’ve been curious about the $150 Xbox Elite controller since it first launched back in October of 2015. The concept of a more-customizable, better-built Xbox controller is very intriguing, and I love paddles. (They were my favorite thing about the Steam controller). This controller has four! When the Elite first launched, it was the only Xbox controller to have a headphone jack built-in…but that has since become a feature on the $60 standard models, along with the improved bumper response. The standard models also have a feature that the Elite controller lacks: Bluetooth connectivity for Windows PCs. It’s kind of crazy that the Elite costs more than twice as much as the standard controller, and lacks a feature. People have speculated that Microsoft would update the Elite controller someday, but so far…this hasn’t happened. I could never quite swallow the price premium even though I was curious to check out the controller. Also, after all this time, numerous folks report long-term durability issues with certain components(see this Crowbcat video), which made me worry. I had some Best Buy rewards points things come through recently….so I took the plunge. I’ve already returned the controller to Best Buy. Here is my review. The Elite Controller stripped bare of all its extra parts, plus its fancy case and cable. The Elite Controller comes in a very sturdy, heavy box, and is well-packaged. It sits atop a little platform inside, contained within its hard-shell case. The case is nice, and features a little Xbox logo on the top. My logo had weird scuffs on it, which bummed me out. The controller comes with a wide variety of magnetic parts you can swap in and out at your leisure. It comes pre-installed with standard analogue sticks, the circular d-pad, and four paddles on the back. Also in the case is a little tray which holds the paddles, a standard d-pad, and two extra sets of sticks. I like the extra sticks quite a bit. Both sets are taller than the classic Xbox sticks. There’s a medium-height set with convex PS4-style rubber tops, and a tall-height set with standard concave tops. Both sticks allow for increased control precision in shooters, at the expense of ergonomic comfort. I prefer the feel of the original sticks the most, but the other sets get the job done. The last inclusion is a long braided USB cable. I don’t really know why this is here. I guess so you can use it with a PC sans wireless adapter, or in a tournament situation? 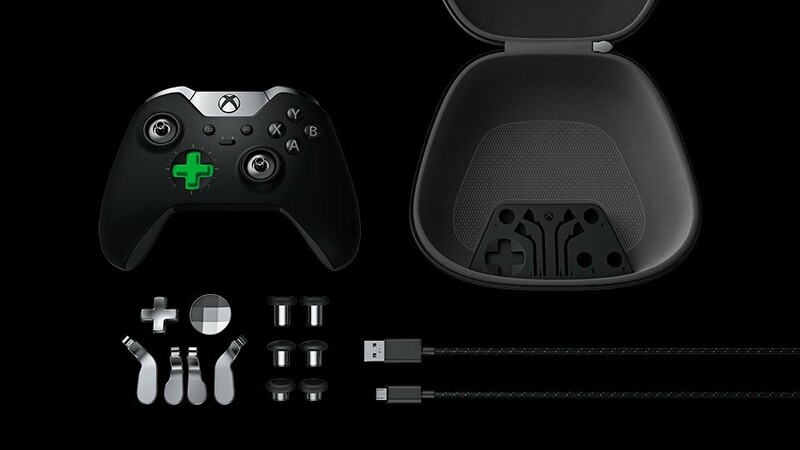 You probably already have at least 100 million micro USB cables in your home if you’re the sort of person who would consider a $150 Xbox controller. It’s easy to set up and configure the controller. The magnetic parts click into place firmly, and come off easily. On Xbox One or Windows 10, you can use a free Microsoft app called Xbox Accessories to customize all sorts of things, from button mappings to stick sensitivity to the brightness of the Xbox button. It also has an intensity setting for the individual vibration motors. I had fun cranking up the impulse trigger motors and feeling them. I’m weird. It’s totally an Xbox controller with extra sticks and some paddles. It’s exactly as responsive and usable as the regular controller. The paddles are easy to reach, and quick to customize. The weight is nice. The metal bases on the sticks are nice. If you’ve liked the Xbox One controller before, this is like that but heavier. I really liked the circular d-pad. Lots of people hated this new d-pad, but to my fingers it felt quite nice and I had a great time with it. It was the one thing I unequivocally preferred to the standard model, actually. Weird huh? In no way does this feel like a $150 product. It’s a bummer. My bottom left paddle was inexplicably loose. It kind of wiggled around in the slot, and made a louder click than the other paddles. Sometimes it wouldn’t fire quite right. If I swapped the paddles around, this problem went away…leading me to believe the actual metal piece wasn’t molded correctly. This wasn’t the only build issue my controller had. Far from it. One of the two sticks in the convex medium-height set was slightly too large to easily slot down onto the controller, and its magnetic force was much weaker than the other two sets. The sticks normally plop right down into place kind of like the satisfying magnetic Skylanders Swap Force figures. This one convex stick wouldn’t do that, and would sometimes come loose in the middle of play. No good! My left stick made a number of clicking sounds and loud squeaking sounds on movement, regardless of which top was installed. At one point I thought a bird was squeaking outside my window…but then it turned out to be my controller. Is it possible that I just had a bad unit? Yes. Of course. But see, these issues are all in line with the many reports I read around the internet. They are not problems unique to my controller. Aside from the nice weightiness and the metal components, there is no way this thing is worth the $150. Further, it’s not as ergonomically sound as the standard controller. The standard one has a very nice fit in the hands. While the rubberized grips on the Elite are nice, the paddles get in the way of your fingers, and you kind of have to gently float your hands around the paddles. Grip even the tiniest bit, and the paddles will click. You can just take the paddles out…but then why have you purchased this in the first place? Because you want your controller to be heavier? The standard controller now has textured grips, and they work just as well as the Elite grips. Plus, I’ve seen reports of rubber peeling off the Elite grips over time. The standard model grips can’t peel because they’re just molded plastic. Don’t buy an Elite controller. Just don’t do it. $150 is a lot of money. You could buy two of the newer standard controllers and have a little money left over for an indie game download. Those standard controllers come in fun colors, have Bluetooth connectivity for your PC/Mac, and have a better overall feel in the hand, in my opinion. The Elite’s paddles are fun/give a distinct control advantage, and the new sticks are cool (if they fit on right), but the build issues add up and make it feel cheap. Alternately, just watch this Crowbcat video of controllers failing I also linked above. He nailed it. Thank goodness I could return mine in the return window.